Djurleite (white, centre bottom) is intergrown with bornite (pink-brown, centre). 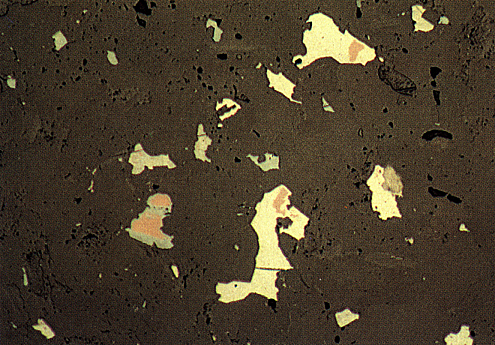 An aggregate of TiO2 mineral grains (light grey, centre right) has djurleite overgrowing it. Some of the djurleite crystals are tarnished to pale blue (centre and centre left). Calcite (dark grey) is the matrix and shows faint bireflectance (bottom right). Black areas are polishing pits.